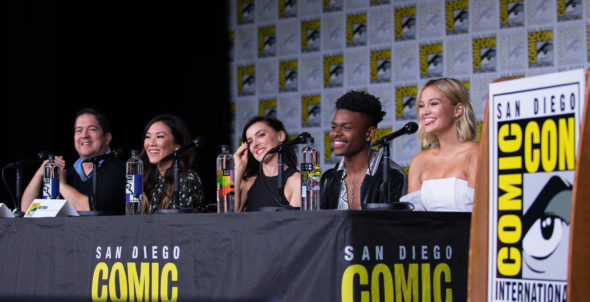 Joe Pokaski (Executive Director), Ally Maki, Emma Lahana, Aubrey Joseph, and Olivia Holt. The drama will continue for Tandy and Tyrone on the Marvels Cloak & Dagger TV show. Freeform has announced that superhero series will return for a second season of 10 episodes in 2019. Marvel’s Cloak & Dagger stars Olivia Holt, Aubrey Joseph, Andrea Roth, Gloria Reuben, Miles Mussenden, Carl Lundstedt, James Saito, J.D. Evermore, Emma Lahana, and Jaime Zevallos. The teen superhero drama follows Tandy Bowen (Holt) and Tyrone Johnson (Joseph). These two teens, from different backgrounds, share a strange connection and start exhibiting unusual powers. Ty and Tandy soon find they’re better together than alone. The problem is, they are developing feelings for each other, and that makes everything just a little bit more complicated. Eight episodes of season one have aired thus far and they’ve averaged a 0.20 rating in the 18-49 demo with 596,000 viewers. It’s one of the cable channel’s top-performing scripted series right now. What do you think? Have you been watching Cloak & Dagger on Freeform? Are you glad that it’s been renewed for a second season? I LOVE this show. From episode 1. Its a shame we gave to wait a year between seasons! Love the show Cloak & Dagger so refreshing and interesting from the normal shows on TV.